In wireless communication, the signal of a typical broadcast station is transmited from a broadcast center p and reaches objects at a distance, say, R from it. In addition there is a radius r, r < R, such that the signal originating from the center of the station is so strong that human habitation within distance r from the center p should be avoided. Thus every station determines a region which is an “annulus of permissible habitation". 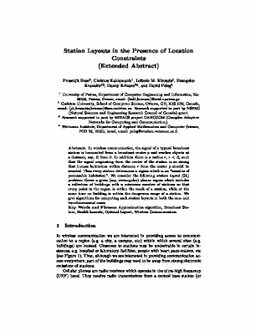 We consider the following station layout (SL) problem: Cover a given (say, rectangular) planar region which includes a collection of orthogonal buildings with a minimum number of stations so that every point in the region is within the reach of a station, while at the same time no building is within the dangerous range of a station. We give algorithms for computing such station layouts in both the one-and two-dimensional cases.